Hi every body. It is first time that I grow tomato. I don't have enough sun light so I grow my tomato under cfl light. It is 6 days after seeding and some of my seeds germinated. But they have purple stem. The temperature is 22c at night and 30c during day. I use a 23 w cfl light and aluminium foil for reflect. Can anybody help me what shoud I do? The other thing is that I am not sure if these seeds are cherry tomato!? Are they cherry tomato seed?? I wouldn't worry so much yet. A lot of times stems will be purple, it can be from cooler temps. There is no way to tell what type of plant they are from the seeds. You can not tell from the plants either at this point. sit back and relax all should be good. Once they get a little bigger and have at least 4 true leafs you will need to put them in bigger pots. Those are not cherry tomato seeds and your seedlings coming up are not tomato plants. Looking at your seeds and your seedling coming up it is possible you have moonflower vine. What made you think they were cherry tomato seeds? Last edited by rainbowgardener on Wed Oct 15, 2014 12:36 pm, edited 1 time in total. the poster mentioned purple and so you thought of the way tomato seedlings can get purplish leaves and stuff, but this is PINK. 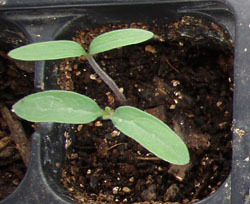 there is no way to tell from a tomato seedling whether it is a cherry tomato or not, but we can look at seedlings and know they are not tomatoes. Anybody? Apparently gixx made his post and then left again.... It makes me nervous to be contradicting him, since I know gixx has started more hundreds of tomatoes from seed than I have. Anyone want to confirm for me that I'm not crazy??? Thanks for your reply. It is the first time I grow tomato and I never grow any vegetables and didn't knoe how its seed look like. anyway thanks every body for reply.i wait too see what happend and ask again. I wanted to grow cherry because its small and easeir to grow indoor because I do not have enough light. If it was not. I should try again. I search Google and I think it's red cabbage seed and the plant is like the one I see in Google. If it is cabbage how long does it need CFL light and for this plant what temperature is needed? Please help me before they destroyed. Planning to plant something between each tomato next year!